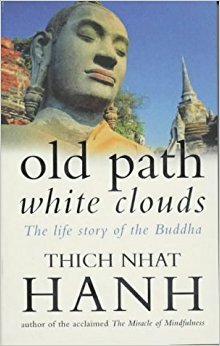 In Thich Nhat Hahn’s Old Path White Clouds, subtitled The life story of the Buddha, the first 80 chapters give us an account of the Buddha’s life and work until his death at the age of 80. The 81stchapter (the last) shows the interested reader how the Buddha’s teachings—and in a sense, the Buddha himself—have continued to live on. Old Path White Clouds tells the life story of the man called Gautama, in order to let the reader discover how his awakening changed the world around him. In doing so, the author relies on Buddhist texts, meticulously providing necessary references. These are provided at the end of the book, with a brief summary of each chapter. I found this enormously useful, because it helps one to refer back quickly to earlier pages and refresh one’s memory about names and events, given that this is a sprawling narrative. As a novice practitioner of Vipassana meditation, I approached this book with great interest and reverence. Almost every story I read here I have heard repeatedly in dhamma talks by teachers. That repetition seems to rejuvenate the practice of meditation for me. Many stories attributed to the Buddha are open-ended, thereby offering fresh insights every time one hears them told. For the reader who is looking for a crisp biographical account of Gautama’s life and times, with documented historical evidence based on secular sources, this work could be a disappointment. Could be, I hasten to add, as the Buddha’s life imparts its meaning through his teachings, which were preserved for a long time in the oral tradition of chants and recitation. Thich Nhat Hahn’s story of the Buddha takes the reader gradually on the unique path of awakening, as experienced by the Buddha and preserved in chants. This exposition of the awakening and the Buddha’s message are beautifully handled, everything explained with a calm and quiet sense of purpose, delivering the teachings in the best possible way, from the simple to the increasingly complex concepts. “Be a lamp unto yourself,” we are told. What is taught is to be experienced. This is the only way to be awakened. For all the uniform simplicity adopted by the bhikkus and for all the apparent absence of a hierarchy within their community (also called the sangha), I found it wonderful to read a passage towards the end of the book where the Buddha is remembered as describing several venerable bhikkus by their unique individual personalities. Sariputta is the teacher, Yashodara is the kind helper of all beings, Moggallanna represents courage and energy, Mahakassappa is the personification of simple living, and Anuruddha exemplifies diligence and great effort. Reading this book, I travelled on the old path year by year, retreat by retreat, and season by season. I stopped and exulted in the beauty of trees and flowers, delighted in the taste of sweet tangerines, and suffered the pain of loss. Those moments passed and that’s the experience. As I immersed myself in Thich Nhat Hahn’s book, I was reminded at regular intervals not to lose myself in the story, not to lose myself in the teaching, not to cling to the pleasure (however sublime) that the reading gave me. Subtly and gently, I was nudged awake to stay aware of every moment in life, observing with attention the reality of the here and now. There was a special reason why Old Path White Clouds came alive to me at this time. I had only recently made a trip to Bihar and seen many Buddhist sites; and therefore, with the handy map provided in this volume, events and images along the old path seemed immediate and familiar. And of course, the Buddha’s presence was the most familiar of all.